Cdn $50.00 +Kit fee: $15, payable to the instructor the day of the class. 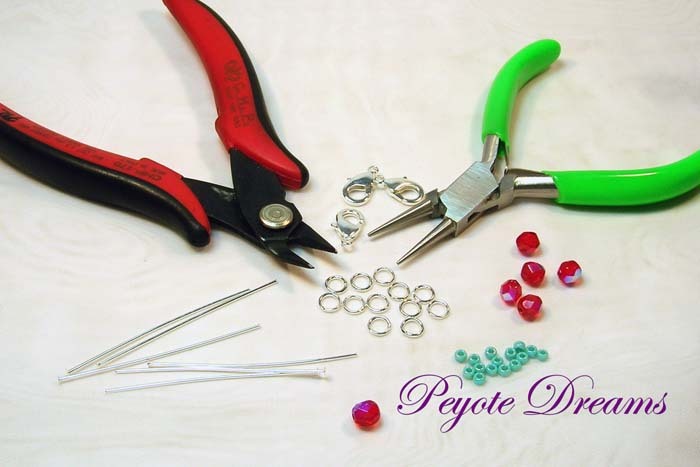 Course outline: Do you want to create jewellery for yourself but have no idea where to start? Join Pamela Kearns for this ‘newbie’ course and discover just how easy creating jewellery can be. Participants will be able to create up to three of pairs of earrings and a bracelet. You’ll learn how to use headpins, open and close jump rings, create wrapped and simple loops, and discover how to use crimps. You’ll also learn about what tools you’ll need to start with and which ones you might want later. This class will feature lots of demos and personal interaction. This information-packed class will be kept small so that everyone will be able to get personal attention. Detailed written and illustrated instructions will be provided and you are welcome to use your phone’s camera feature to record demos for future reference. Note: a kit is required; see details below. Technique: General jewellery making techniques including crimping, making simple loops, wrapped loops, opening/closing jumprings, attaching earwires. Bring to class: Creativity & enthusiasm; magnification if required; a selection of beads, stones and/or crystal for your projects. Lots of samples will be shown to give you ideas! Of special note: the class patterns and instructions from our classes are for your personal use only. Please respect the intellectual property of our artists/instructors by not sharing, selling, or teaching the patterns you receive from the classes you take. How to Register and Cancellation Policy: see details below. $15, payable to the instructor the day of the class. All silver-plate findings, wire and beading wire for your projects and a detailed reference handout.